It doesn’t happen often so why not get excited about it. Cody Leavitt – of Asteroid M Records. Has a recording studio adjacent to the kitchen in his vintage Las Vegas Home, Paradise Palms to be exact. He has been using his love for Punk Rock and infatuation with helping others to create a music collective. Asteroid M Records is Leavitt’s avenue to be creative and push friends and other musicians to get their stuff out there. They will feature live performance “Sessions” of Vegas local bands (and more) and full length records. With the attitude of “we are all in this together”, Cody is looking to keep making music and helping friends though Asteroid M records. Here’s to wishing him the best of luck in his endeavors. Cody invited Brock to record a live session with some friends travelling through in attendance. Friends got phone footage of the performance and it was edited together to illustrate the song. Here is the Video for Asteroid M Sessions – ” What Doesn’t Kill Us” by Go Bold’s Brock Frabbiele. 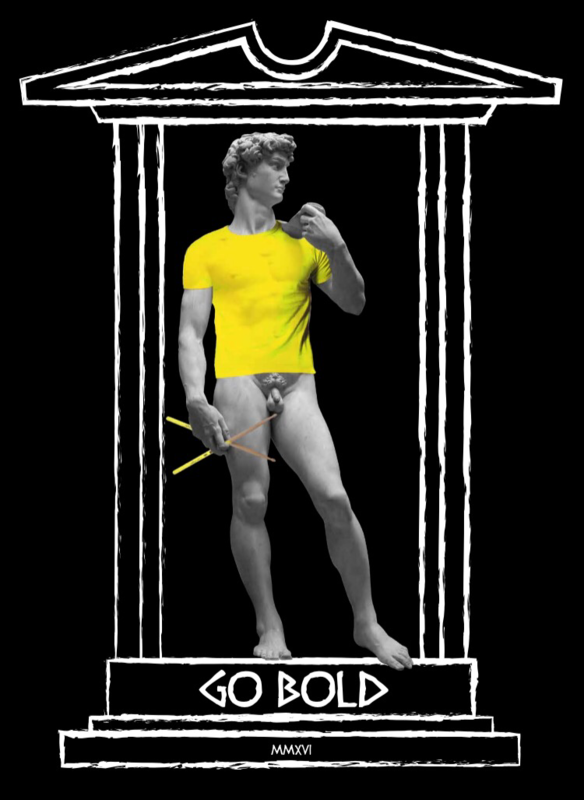 Today is DaveinYellow’s Birthday so we are proud to present you with Michelangelo’s David in Yellow. “Vegas Strong” is out now! This comp features new, rare and/or unreleased music from The Wonder Years, DIRECT HIT!, Happy Campers, The Menzingers, Lemuria, Go Bold, Beach Slang, Taking Back Sunday, Mercy Music, Off With Their Heads, War Called Home , The Smith Street Band and over 100 more bands. 100% of the proceeds go to the UMC Foundation, which is Las Vegas’s only Level 1 Trauma Center. The outpouring of support has been sweet and incredibly heartwarming and we hope you enjoy the music!